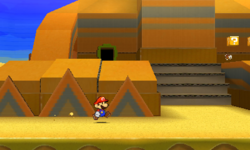 Yoshi Sphinx is World 2-2 featured in Paper Mario: Sticker Star. It is located in a desert area that features a sphinx shaped like Yoshi with many doors and secret passages. Yoshi Sphinx is located in a mysterious desert area. Mario starts in a remote platform with a pipe and some Spinies. This pipe will take Mario to the main quadrant of the sphinx. To the left is a door, and to the right is two blocks guarded by a Spiny. Mario must enter the door to progress. It takes him to a room with a Dry Bones and two torches on the wall; Mario can hit the torches from below to light them. On the right of the room is a door that takes Mario to another room somewhat alike the first one, except on the middle of the wall there is a different pattern. Mario has to hit the shape in the center with his hammer to discover a slot on the wall. He must then enter it to reveal another room with four doors, a Pokey and a Spiny. One door is hidden behind a beam that leads to a dark room with a passage to the piece of the Sticker Comet. When Mario reaches the door, he will be attacked by three Paratroopas. After defeating the three Paratroopas, Mario gains access to the piece of the Sticker Comet, completing the level. If Mario goes into the archway, there is another bright area, one of which has the Lightbulb Thing. After Mario reaches the top of the sphinx and slips off onto the tongue, Kamek will be fought, but this time, he will transform all of Mario's stickers into sandals. After defeating him, a tablet piece neccesary to enter Drybake Stadium is obtained, then the tongue retracts, while hearing a very deep, "Yooooshiiiiiiiiii!" swallowing Mario with it. Mario's Stickers are returned to normal. The Secret Door location is on the ground level of the Sphinx. The player needs to go around to the other side (right side) of the base where the outline for the sticker will be along the wall guarded by a Spiny. The door leads to the Paper Fan Thing. A picture of Yoshi Sphinx can be seen in Dark Bloo Inn in Paper Mario: Color Splash.